Wired Up provides full instruction for four amazing mixed-media projects that use wire! 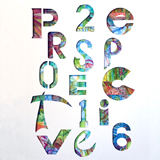 Featuring projects from Kelly Snelling & Ruth Rae, Giuseppina Cirincione, Jennifer Swift and Robert Dancik! Create Mixed Media and Cloth Paper Scissors have each been featuring their own great content for years. As members of the same F+W Media, Inc. family, we decided it made sense to combine our superpowers into one top-notch site and early this spring you’ll see us merging together for more inspiration than ever before! More details to come soon. Click here to take a look at Cloth•Paper•Scissors! Many of us like to pick a word we will use as a focus in the year to come. Keep your inspiring word where you can see it and enjoy throughout the entire year. Follow along with this tutorial to discover a fun and reflective way to make an attractive piece of art you’ll be proud to display in your home. It may even inspire others! 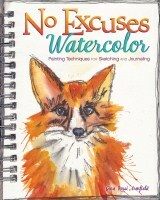 Artist Gina Rossi Armfield, author of No Excuses Watercolor, shares a few intimate thoughts with us on the creation of her latest book. Read what she discovered about herself in the writing process and get a peek at her favorite spreads inside the book. Inspired by Danielle Donaldson’s book creativeGIRL, this fun project is not only a great way to chronicle your life in a tactile and dynamic way, it’s also perfect for trying out those creamy watercolor paints you may not have know what to do with just yet. Explore your soft side and try this fun exercise today! 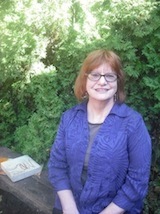 Presenting Serena Barton, author of Wabi Sabi Art Workshop and Wabi Sabi Painting with Cold Wax. Among other tidbits, in this artist profile, you’ll learn what’s on Serena’s worktable, what music she listens to and what word she lives by. You’ll also find out what she would choose as her one superpower if given the opportunity. Learn more about this down-to-earth artist here! It’s time to announce the list of winners for this year’s edition of Incite! After multiple rounds of judging hundreds of entries, the winning art pieces for the Incite 4, Relax, Restore, Renew: Best of Mixed Media book have been selected. With many new names and several familiar ones, the editors of North Light Books would like to congratulate everyone on this list! 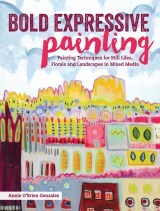 This new book by well-loved artist Alena Hennessy is definitely for you if you enjoy painting abstractly, you want to acquire more confidence in your style and you are hungry to take your art-making process in a new direction. With an entire year’s worth of inspiration, you’ll never be short on painting prompts. A great painting starts with a strong underpainting. In this quick-and-easy tutorial, Annie O’Brien Gonzales, author of Bold Expressive Painting, shares a fun process for your painting’s first layer that will really get you moving! Watch previews and find out about 4 new hand lettering instructional videos from artist Joanne Sharpe, author of The Art of Whimsical Lettering. Today we feature a podcast with Sal and Ellen, the creators of Art Is You retreats, as they talk about Living in Generosity. Stay up to date on Mixed Media & get a free ebook! Get Crafty at the North Light Shop! Shop at the North Light Shop and SAVE! Join the North Light VIP Program Today! Join for the tools and inspiration to create successful art! Cutsom web sites just for artists! 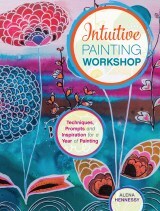 Making fine art education rewarding and fun for hobbyists!